Just thought I'd jump on the Internet machine and wish you a Happy New Year! Looking forward to a great 2008. Chat with you all again soon. This has to be photo of the week (actually last week). I don't know how in the world this didn't get run all over the place. This is what I call "a strong photo." It sort of looks like a scene from a David Lynch picture. This guy looks like he is jamming! I stumbled on a great book this past year that clearly spells out the purpose of our humanity. 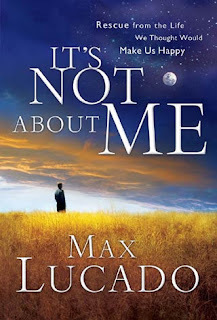 The book, "It's Not About Me," by Max Lucado, really impacted me, and I highly recommend it. The book challenges Christians to look at their lives as conduits of God's glory, and recognize that everything in their lives, the pleasures and successes, the losses, the problems, the distresses...everything, is ultimately designed to demonstrate God's glory here on the Earth. It's a concept that all believers should be aware of: that we are not our own and everything in our lives works together for our good and His glory. At times, however, I think we have the inclination to forget it (at least, I get my eyes off that idea at times). Lucado writes: "Your pain has a purpose. Your problems, struggles, heartaches, and hassles cooperate toward one end--the glory of God. 'Trust me in your times of trouble, and I will rescue you, and you will give me glory.' (Psalm 50:15 NLT)." This book isn't just about the tough times or challenges. He points out we should recognize that our victories and times of blessing are all about Him as well. These are gifts from Him to reflect his glory and power on the Earth. Just like the time Moses beheld God's glory and that glory reflected from his face, our very lives should reflect God glory to those we come in contact with. This should be our ultimate goal. Struggling to understand your current situation? Don't know what purpose God could be carrying out in and through your life right now? What is the purpose of your humanity, no matter what your situation? "Reduce the human job description down to one phrase, and this is it: Reflect God's glory," Lucado says. Let's make it our goal this coming year to remember that our number one mission is to reflect God's life-changing glory to the world around us. Nothing more. Nothing less. Renewing this perspective could change everything around us. I just wanted to drop a note to wish you all a very, very Merry Christmas tomorrow! I'm planning on spending Christmas with my brother and sister. Christmas will be different this year because it is the first Christmas since our mom went home to be with the Lord, and I have family (sister, brother-and-law, niece) that have moved out of state this year. It may be a smaller crew here this year but it is still Jesus' birthday, and we will celebrate as such! You all be blessed as well. The Astros, under Ed Wade, will apparently look completely different next year. The proof of his success will be in wins and losses, but I'm looking forward to seeing how all these changes pan out for the Astros next year. I found an article on the Chronicle's Web site, and I got a good chuckle from Chad Qualls quotes. Qualls is going to the Arizona Diamondbacks next season as a result of Wade's changes. "It's a tough pill to swallow," he said. "I just bought a house in Houston, I just got married this offseason and my wife is from Houston. It's hard to take her away from her family. "I think it's going to be tougher for her than it is for me. We're going to get through it together, and she's behind me and supports me. Hopefully Arizona brings me good things." My goal is to never be critical here...but is he kidding? Do you think it is possible, at times, that these folks forget what they do for a living? Even if he's paid the league minimum, he's going to get several hundred thousand dollars a year to play catch a few innings a week. Sounds like Arizona is going to bring him some pretty amazing things. Thank goodness he has a dedicated wife to help him through these difficult times. As torturous as a move to Arizona may seem now, I have a feeling they'll get through it together just fine. It just goes to show you, these people live on another planet. 'Luv Ya Blue' Oilers honored at Reliant this past weekend -- John McClain should never let go of the past, but he should adjust the volume on his microphone very soon. Fresh turkeys in Long Beach -- No frozen supermarket turkeys for Thanksgiving at this store. Let's just say it like it is: Mahammed Hassam will hook you up. It's going good, people are happy, and when he sees people are happy, he's happy. 'Noelle' released Friday. Gordon Robertson of the 700 Club calls it "wonderful" -- That should be all the reason you need. Showtimes are available through the site. Prostate getting a tad too big? You might need a Botox injection -- Dr. Chris Smith is at it again. I call him Dr. Botox. No one wants a "decreased force of stream," whatever that is. Go see him and get your shot. The 53 Places to Go in 2008 -- A fantastic travel idea resource, which could be a good tool for the Princess to determine places she might want to visit someday (in addition to Griffith Park, of course). Drama King Tony Romo destined to be a Super Bowl Competitor? -- The sooner the better, I think. "The eyes of all look to you, and you give them their food at the proper time. You open your hand and satisfy the desires of every living thing" (Psalm 145: 15, 16). Hi, angel. I think you're probably discovering that we're going to have to be knee deep in the Word, constantly, before God opens the door for us to be together. Stay strong and hang in there! Are you having any luck with our code from two posts ago? Princess, do you mind if we visit this place someday? I've never been, and it looks like an interesting spot. I wonder if you have any places you'd like to visit? "And that about wraps it up. God is strong, and he wants you strong. So take everything the Master has set out for you, well-made weapons of the best materials. And put them to use so you will be able to stand up to everything the Devil throws your way. This is no afternoon athletic contest that we'll walk away from and forget about in a couple of hours. This is for keeps, a life-or-death fight to the finish against the Devil and all his angels. "Be prepared. You're up against far more than you can handle on your own. Take all the help you can get, every weapon God has issued, so that when it's all over but the shouting you'll still be on your feet. Truth, righteousness, peace, faith, and salvation are more than words. Learn how to apply them. You'll need them throughout your life. God's Word is an indispensable weapon. In the same way, prayer is essential in this ongoing warfare. Pray hard and long. Pray for your brothers and sisters. Keep your eyes open. Keep each other's spirits up so that no one falls behind or drops out." (Eph. 6:10-18 Message). This is the Message translation of some familiar verses in Ephesians. I have read those familiar scriptures for years, and I have never been more convinced of their absolute truth than I am now. We struggle not against flesh and blood. It sure seems like we do at times, but make no mistake. This is spiritual. Sweetie, there is nothing I want more than for us to be able to begin the life God has for us together. But I've come to realize that "us" is a reward on the other side of the trial I'm going through. My heart longs to meet you and get started on our life together. But I realize the importance of the season I'm in. I have no choice now but to wait on God and trust in Him. Psalm 27:14 says, "Wait on the Lord; Be of good courage and he shall strengthen your heart; Wait, I say, on the Lord!" Write it on an index card and hang it up somewhere if you need to. Sometimes we complicate the spiritual battle we're in. The enemy's strategy is very simple. Wear the people of God down. Continue to hold out until they simply can't wait anymore, and they give up. Here's the strategy God has given me: Don't quit, ever. And you know how he gives me extra incentive not to give up? He's puts me in a situation where I can't give up. Where everything is dependant on me standing and seeing the salvation of the Lord. So I stand. And I pray for you every day. I can't wait to meet you, whoever, and wherever you are. Be blessed, angel, and give yourself fully to the gifts and talents God has given you. "Remember those early days after you first saw the light? Those were the hard times! Kicked around in public, targets of every kind of abuse—some days it was you, other days your friends. If some friends went to prison, you stuck by them. If some enemies broke in and seized your goods, you let them go with a smile, knowing they couldn't touch your real treasure. Nothing they did bothered you, nothing set you back. So don't throw it all away now. You were sure of yourselves then. It's still a sure thing! But you need to stick it out, staying with God's plan so you'll be there for the promised completion. It won't be long now, he's on the way; he'll show up most any minute. Not that I have any doubters that read this blog, I just thought it might be important to reestablish God's view on any situation you might be facing today. You and I aren't going to quit on God. He's on your side. Well, He's on my side, too. If you're facing something today and it doesn't appear the answer is coming as quickly as you'd hoped, rest assured, the answer is on its way. No quitting. No giving up on what God has promised you. Do you feel you've been waiting a long time? Join the club. The greater the promise, the greater the fight. No retreat. Stand fast and watch God do the impossible in your life -- in His timing. Well, it looks like the Dallas Cowboys are going to the Super Bowl. Granted, Favre did get injured in the second quarter of tonight's game against the Green Bay Packers so we can't know what he would have done for his team in the second half. I read, however, the Cowboys were pretty dominant. Somehow this game got blacked out in the Houston market. I learned what I know about the game from reading Richard Justice's blog. You know, I'm actually excited for them a little bit. Isn't that strange? In the days of the Oilers, admitting you were rooting for the Cowboys for any reason was a sacrilege. Which brings us to Sunday's game in Nashville. I know what your saying. John, will you just get over the Oilers? Never. If you were alive, you remember where you were when you heard J.F.K. had been shot. Everyone remembers where they were when the O.J. verdict came in. And I remember precisely where I was the moment I heard for the very first time that Bud Adams was entertaining the idea of moving the team. Standing at the payphone on the second floor of the barracks, Marine Corps Logistics Base, Barstow, Calif. I've never been quite the same. No, I'll never get over the Oilers. I was crazy about the Oilers. I went through some family photos the other day and found a picture of me in a "Houston Earlers" t-shirt as a kid. One year I dressed up as Earl Campbell for Halloween. That's tough for a 80-pound white kid to pull off, but I still insisted on trying. Speaking of Earl and Oilers memories, I found this on YouTube. I was just a kid and still remember this night in '78. Was this guy amazing or what? I'd been looking for a copy of this game against Miami for years on eBay, and thanks to YouTube, there are the highlights (including that amazing run at the end). Oh, yeah, the Texans. That's right. We now have the Texans. And I am a Texans fan. And Sunday we get to see them go to Nashville to play the Tennessee Titans. That match-up will never be a regular football game to me. I'm looking forward to seeing what happens this time. Texans-Titans have been interesting to say the least. So what's all this have to do with the helmet of salvation mentioned above? Nothing, really. I just saw the Oilers' helmet and thought of that scripture. Let's talk about that scripture for a minute. I'm saved, I've got on the helmet. I've got my sword, the Bible. I pray in the Spirit quite frequently. You should do the same. Bless God! That was an extremely easy devotional to write. Could T-Bone be as cool as TobyMac? This really is a good song. Hello there. Just wanted to say "hi" and Happy Thanksgiving to you, if we don't talk again before tomorrow. Be blessed! 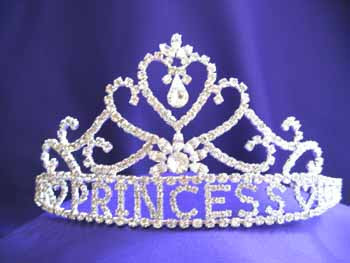 This would look good sitting on top of her pretty head. As I sat in front of the computer the other night, a television was on unwatched in the other room, and it was a little loud. I don't know what was on the TV, but the sound of gunfire reverberated through the house. It brought back some memories. I wanted to run something past you. I've been going over this again and again in my mind for the past several years. Maybe you can assist me in understanding how freaky it is. Who knows, maybe it's not freaky at all. 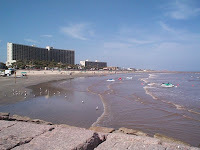 I was living down on Galveston Island several years ago. Something began occurring there that I haven't been able to process completely. On several occasions (maybe as many five times or more), there was the sound of gunfire right outside my condo in the middle of the night. Once it sounded like a shotgun. But every other time it was the same. Four or five rounds from a handgun, squeezed off in rapid succession. Frankly, it sounded like someone was being executed in the courtyard. Trust me, that will sit you up in bed real fast. The thing is, I didn't live in a bad neighborhood. I would venture to say that the area around The Oceanfront Apartments (then called Seaside Point) on Seawall Boulevard is what folks on the island would call a relatively nice part of town. Gunfire in that neighborhood should be very unusual. 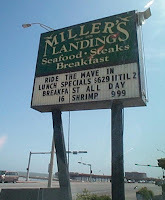 I experienced it many times, including the very last night I stayed in Galveston, ironically. Not the kind of memories I wanted to take from a place I enjoyed so much, but I understand some people need Jesus. Other than the gunfire in the complex, this was a fantastic place to live. Sand volleyball and tennis courts with a pool and hot tub in the center of the units, all right across the street from the crashing waves of the Gulf of Mexico. Just look at how nice the complex is by clicking here. Doesn't look like a "gunfire" neighborhood, does it? Please don't let anything I'm saying here dissuade you from renting there. It's wonderful. And I know for a fact that when criminals aren't firing guns, it's a civil place and a nice area to live in and visit. I used to have a bunch of people come down to the island on holidays or long weekends. We'd BBQ and get in the pool, get on the seawall and hang out all day and into the night. Good times. Oh on another note, please check this guy out. He's got a great singing voice, and it's one of my all-time favorite songs. Anyway, I dismissed the gunfire as a fluke (or thought perhaps someone in the neighborhood wasn't making friends and influencing people correctly), and ended up moving into southwest Houston. Guess what? I must have a knack for ending up in areas prone to gunfire. At that residence, I encountered the same thing. On multiple occasions (at least three or four). They were always in the middle of the night. It wasn't just one or two rounds, either. Four or five rounds fired off very quickly, right outside. Have you ever been awaken in the middle of the night by gunfire outside your place? It's terrifying. How about 8-10 different occasions over the span of two or three years? At different residences? In neighborhoods where that shouldn't be happening over and over? It's odd. And frightening. I like how Laura Elder and Leigh Jones sometimes ask questions at the end of their blog to spur conversation or get people thinking about an issue, so I'll try it here as well. Would you find multiple gunshots outside your apartment or house, more than say, five times in a 12-18 month period, odd? What if it occured at two different residences? When was the last time you heard gunfire at your residence? Have you ever heard shots twice in a couple months, or three or four times in a year? Maybe you all are encountering this as well and it isn't strange at all. Please let me know how rare this really is. I'll see what you all think about it, and maybe we'll talk more about it in a later post. Who knows, I may just do a series on "freaky." You walk by faith, not by sight, remember? "For we walk by faith, not by sight" (2 Corinthians 5:7). I had a great day Friday, really doing nothing. When I got up and spent time with the Lord, I felt he wanted me to tune out every voice that wasn't His. I spent the day focusing on God and his promises. As much as I've possibly been able to, I've tried to tune out the computer, all those web site, the news, etc. I just concentrated on being still. I don't do enough of that, really. I highly recommend it. If you're going through something, why not spend a day just being quiet...not allowing the outside influences and voices to interfere with what God is doing in you. Keep the TV off. Keep the radio off. Stay off the web. I find it's amazing how clear the still small voice becomes when He's not being forced to compete with everything else. Maybe when you look out into your life today or tomorrow you don't see everything you'd like with your natural eyes. Maybe your circumstances aren't perfect. Maybe you feel like your waiting on something that will never come. I would encourage you today to choose to walk by faith and not by sight. Just because you don't see those things coming to pass right now doesn't mean God is withholding from you. Trust God. You're not alone. He'll never leave you or forsake you. He's always working on your behalf, even when you don't see it. The second smooth stone is ready to fly. Ya'll ready!!???!! "Instead of their shame, my people will receive a double portion, and instead of their disgrace, they will enjoy their inheritance; and so they will inherit a double portion in their land, and everlasting joy will be theirs" (Isaiah 61:7). David was something else, wasn't he? What gave David the boldness to do what he did when he faced Goliath? Well, there were actaully a couple things. One, he knew who was backing him up. He also had the truth on his side. The truth was that God never leaves his people and always, and I repeat, ALWAYS, gives them the victory. Every one of us has a Goliath in our life. It might be a set of circumstances, a sickness, or even people who have declared war against God and his people. Yes, that does still happen...it's not just little stories in our Bible. Our God never changes, he's the same yesterday, today and forever, and so are his enemies. "Come here," Goliath said, "and I'll give your flesh to the birds of the air and the beasts of the field" (1 Samuel 17: 44). Taunting. Death threats. Stealing resources or joy from God's people. That's just like the maggot of the devil we war against. Can't fight fair so he has to threaten the people of God. Well I've got a news flash for the devil. Our God has given us everything we need to fight our individual Goliath. Just as David reached down and grabbed those smooth stones that brought down Goliath, if you look hard enough, you can find those smooth stones in your own life. When my thinking is fouled up, I sometimes feel I have nothing to fight with. Maybe he lies to you and says the same thing. You do have something to fight with. It may just be a scripture that you hang on to and confess. It may be a talent or gifting. Who knows, it may be a blog that with the push of a button can publish truth to the world. Somedays I've wondered if my silly little blog is a smooth stone. Today, I can tell you without a doubt that it is. No BACKING DOWN!! That's what the spirit of God is saying to me, and possibly that's what he's saying to you today. Take your best shot devil. Mark my words. When this is all said and done, I'm going to feed your head to the birds of the air. That's a promise. You can bet your bottom dollar. God will get the victory, no matter what! Elisabeth Hasselbeck is "dangerous" and "offensive." These are the words of music fossil Barry Manilow, who decided this week that appearing on a television show with someone who might have a difference of opinion than him is something he absolutely cannot do. Barry sounds like a principled man. The problem is, his decision makes no sense. I'm not going to get political on this blog. That's really not my purpose in writing this post. I just want to point out an inconsistency that I'm seeing all too often. This is the perfect example of how the "intolerance" frequently attributed to one side of the political spectrum is often equally as present on the other side. Folks, no matter how differently we may see the world, at the core were all the same. Barry was scheduled to appear on The View Tuesday morning. He said he was upset he had to cancel. "It's really too bad because I've always been a supporter of the show, but I cannot compromise my beliefs." Well, I guess if you're a supporter of a show called The View, you should probably be open to the fact that people can have different views. That's what should make the show interesting. Apparently, in Barry's mind, there is only one view. His. He's wrong there. A former host on that very show stated once that "radical Christianity is just as threatening as radical Islam in a country like America." In addition to being completely without merit, some might conclude those remarks are "dangerous" and "offensive." I have no beef with the person who made that statement. I'm simply trying to make a point. We live in America, and we can all have differences of opinion (and share them), no matter how misguided they are. It seems by canceling his appearance on The View, Barry is compromising his beliefs. I mean, every good, red blooded liberal believes in those inalienable rights we have...or they should. How about the right to live in a society that benefits from citizens that can see things differently? What happened to healthy debate? Keep up the good work, Elisabeth. And to think, I was actually considering voting for a Democrat for president next time. Forget it, that's apparently the party of intolerance. People of faith have appeared on the show before, but the new season of Survivor should prove particularly interesting because a person in a ministry position will compete for the $1 million prize. Leslie Nease, a Christian radio talk show host with WRCM-FM (New Life 91.9) in Charlotte, North Carolina, visited China this summer for a taping of the program. The season premiers on CBS, Thursday, Sept. 20, at 8 p.m. Eastern/Pacific. I've been a fan of the show since the second season, but have often wondered how a Christian might navigate the task of "Outwitting" other contestants. Every alliance must break at some point...only one person can win. So the further the game progresses the more likely someone will have to either vote against a person they told they wouldn't, or align with an individual or group behind someone else's back. Leslie, however, has a unique take on the game. She says you can either see Survivor as a game that encourages deception, or you can do as she does and see it as a game that is about loyalty and learning who you can trust. Hmmm. Never thought of it like that. One reason I think Survivor makes for such fascinating television is everyone enters the game with a different idea of what ethical lines they won't cross. Some may go in determined to do whatever it takes to win. Others may feel that being dishonest with another player is completely out of the question. 3) It's really just a game. Leslie says in the promotional video online that she feels being a Christian radio host will be helpful to her "on so many levels." I'm interested in seeing how that plays out. If you visit the main Survivor Web site right here you can scroll down and there is a video in which you can meet Leslie (and the other contestants) and hear about how she views the game in light of her Christian values. It sounds like she definately has the right attitude going in. Here's a behind the scenes video of what it takes to put the show together. Should be an interesting season. It starts a week from tonight. Great "unplugged" performance from Israel on Thursday's Fox 26 News. Good morning and happy Labor Day. I just felt like sitting down and typing out a few words this morning. I was reading that scripture this morning in a devotional I like to look at. I'm glad we have the word of God, aren't you? There are a lot of things we can read each day -- newspapers, magazines, whatever -- and I often do. I'm a news junkie. I look at news Web sites each day. But before getting your fill of some of the stuff out there, I recommend getting filled up with God's word. God is our source of information about ourselves. He is the gatekeeper. Think about it...if a responsible news organization (and most are) wanted to be accurate in its reporting, it wouldn't go to press without talking to the source with greatest knowledge of the news event or story, would it. No, of course not, that's Journalism 101. Well, Serving God 101 teaches us that we don't develop ideas about ourselves without first going to our true source of information...our Heavenly Father. You see, what we see today is temporary -- God's word will never pass away and it will never return void. I giggle from time to time when I read something in the paper or see something online -- because often wordsmiths of all types go off half-cocked, not knowing fully what they are talking about. However, don't we often do the same thing in a sense, trusting in what our unrenewed minds tells us about ourselves or our situation? The answer? Keep your mind renewed (Romans 12:2). In those moments when this world fills you with doubt and unbelief, make sure you return to the truth...God's word. On another note, the kind mailman placed a Michael W. Smith ticket in my mailbox. Thank you, sir. I will take that on down to the Woodlands next week. God bless you, and thank you to the United States Postal Service for all your great work. Now, here's a touching love song to brighten up your Labor Day. Read your Bible. Brent Hopkins, a reporter with the L.A. Daily News, emailed me asking if I'd consider posting a link on my Marine Corps Web site to an article he wrote on Team Semper Fi. Team Semper Fi is a fantastic sports program that helps U.S. Marines recover after sustaining injuries in combat. The organization provides coaches, specialized sporting equipment, entry fees, and travel expenses for wounded Marines. I added a link to my other site, but I thought I'd place one here as well. Here's a link to his blog entry which includes his article, a link to Team Semper Fi's Web site, and a video. I had a great time last night at the 25th KSBJ Anniversary Show. TobyMac, Israel and New Breed, Mandisa and MercyMe all performed throughout the night. Everyone was excellent. Great show, and somehow the rain held off. Personally, the highlights for me at these shows are always the times of worship. Mandisa -- Because of the traffic on 45 North and the line at the ticket counter, I got seated a little late. I should have left earlier to get out there. I saw the last song of her performance, and she came out to sing with TobyMac. She's obviously a great talent. I'll get my ticket online in advance next time. Israel and New Breed -- I'm biased, Israel is one of the worship leaders at church. Fantastic! This was my favorite part. TobyMac -- Man, that was off the chain (whatever that means). I wanted to dance, just like the dog in this video, but I kept my composure and just clapped at times. MercyMe -- Ending the show with them was perfect. Great time of worship. I look forward to the new CD. On the event of the radio station's 25th anniversary, I thought back to when I started listening to KSBJ. As a freshman in high school, I was really into all the mainstream heavy metal stuff -- and someone turned me on to Stryper's "Yellow and Black Attack" and told me about a show called "The Rock of Love" on KSBJ. Shortly thereafter, my taste for music expanded and I was listening to the station almost all the time. Remember the Imperials, Randy Stonehill, Petra, Second Chapter of Acts? One of the most exciting aspects of Christian music in general is how much the production values have improved. Back in the day, you at times felt you were having to compensate for lack of production quality by adding Jesus lyrics. Not any more. Christian music today often offers the same quality and musicianship as the mainstream, and frankly that's the way it should be. (That's not to disparage the talented musicians in the industry in the early years -- they just didn't have the resources that are available to Christian musicians today). One of my earliest KSBJ memories was winning a Bible verse memorization kit from the station. It was either in 1984 or 1985, and the station used to have a contest at night where they would read a verse and the first person to call in with the correct location in the Word would win a prize. I would sit on the floor with a huge concordance, wait for the first words of the verse, press the final number of their phone number, and start frantically looking up the scripture before they answered the phone. I finally won it and rejoiced. Don't forget, Jeremy Camp is playing at the Astros game on Aug. 11. Craig Biggio announced his retirement today at Minute Maid Park. There are many things that set him apart, but it's funny how what always comes to my mind is him sprinting out to second base from the dugout when the Astros are announced before each game. It may seem like a small observation, but it really encapsulated how he consistently played the game...with his whole heart. I did a search for "Craig Biggio" on YouTube and came up with this video a fan shot from the stands on the occasion of his 3,000th hit. There are several similar videos on YouTube, but I think this one really captures what we were all feeling at that moment. I've been an Astros fan for many years, and have enjoyed many incredibly exciting moments watching that team. More than the playoff games, even more than the World Series appearance, the few minutes captured on this video represent what was for me the most exciting moments I've ever enjoyed at a Houston Astros game. Thank you for what you've meant to this city, the Astros and the fans. Best of everything to you and your family. Those are the milkshakes at 59 Diner...no question about it. I got a call from a friend of mine from high school this week. He is currently pastoring a church out of state and is in town after bringing members of his youth group to Texas. They're attending a conference at the Texas Bible Institute. I credit Tracy as one of the people directly responsible for my decision to follow Christ in high school. I remember having lunch in the courtyard at school and being ambushed one day by Tracy and several other Bible-toting high schoolers. I thought they were lunatics, but they kept loving and praying for me even when I laughed at them and often hid from them. Several months later, something happened inside of me at a Christian rock concert they invited me to. The band was Resurrection Band. I felt the tangible love and presence of God that evening. At the end of the show, the band invited the crowd to enter into a relationship with Christ, but I left the show without praying with the band. That night was the turning point, however. Just a short time later, I knew what Tracy and his friends had was real, and I knew I needed it. I got on my knees in my bedroom all by myself and asked Jesus to come into my life. I was 14 years old. Tracy and I eventually started a Christian metal band called Sanctified, ministered on the streets on the weekends, and became two extremely zealous teenaged believers. Another buddie of ours from that time period is a minister up in Alaska. In fact, several the guys I hung out with in high school are now ministers. Tracy and I both served God together, joined the Marines around the same time, and we both love the Houston Astros. It's always great to catch up with the high school friends when I can. I caught an Astros game last night with him and his wife. Another great ballgame. Hunter Pence homered in the 13th inning for a 5-4 win over Philadelphia. His call prompted me to pull out some old videos we shot back in the day. One of the activities we enjoyed in high school was making goofy films with our video camera. It appears we enjoyed making fun of horror movies. We created and stared in such riveting shorts as "The Fear of Mayonnaise" and "Death Comes to John's House." I know, I know..."Death Comes to John's House" doesn't sound too spiritual. It's not, but it's kinda funny. Here's a short clip. Sorry I didn't include the entire film, but it may be too intense for some viewers. I'm 18 years old in that clip. I really don't fear Gumby. Perfect love casts out all fear. Happy 4th of July! Talk to you later. I ran out and caught a showing of Evan Almighty. Have you heard about this film yet? God tells a modern-day family man to build an arc, just like Noah, and he does. Collegues laugh at him, birds poop on him, and his wife thinks he's nuts and takes the kids to her parents house. It's the typical stuff you imagine would happen to someone if God told them to buy up lots of land to build a huge boat on, started dropping off lumber at their home, and if He didn't ever allow them to shave. And yes, this movie is entertaining. However, a reviewer for something called "Moviefone" said on CNN that "God himself couldn't save Evan Almighty." I heard this remark before going to go see the movie. I went with very low expectations as a result, but I was determined to go, because I have a personal policy to thank Hollywood for this kind of filmaking by buying a ticket. You know what? I enjoyed myself, and the movie inadvertently teaches real spiritual lessons about obedience, faith, and family. Truthfully, there weren't a whole lot of laugh-out-loud moments, but it was a good time. And patrons in the theater I was at applauded at the conclusion of the film, so I wasn't alone in my assessment. I'm not sure our reviewer saw the same film I did. One aspect of the movie that really struck a chord with me is how the filmakers accurately captured what a real faithwalk feels like at times. We know Evan's really heard from God. Morgan Freeman (God) appears to Evan and gives him instructions, so we have the benefit of knowing he's not crazy. But Evan's circumstances scream, "You're nuts!" Anyone who has ever had a faith experience where they have been walking in obedience to the best of their ability, only to feel like God was almost picking on them by a mounting birage of unusual or uncomfortable circumstances will giggle during this film for all the right reasons. The funny thing is when Evan appears to need God the most, He's strangely silent. Almost non-existant. It's like He gives Evan these absurd instructions and then leaves him all by himself to obey and explain himself to a bunch of people who think he's losing it. Ever had to believe God at His word even when it made sense to no one but you and God? You'll probably like this movie. I'm not going to give away any more details here, but God does finally prove Himself faithful, as He always does. A great take-home message is that there are benfits to faith. Go take your kids to see Evan Almighty despite anything a film critic has said. What an unbelievable night at Minute Maid Park! Craig Biggio goes 5-for-6 in what ends up being one of the most exciting games I've ever attended at that ballpark, passing the 3,000 hit mark (3,002 total) and becoming only the 27th man in baseball history to do that. After the Rockies took a lead late in the game, it appeared that milestone for Biggio might be the best we could hope for tonight...then Carlos Lee deposits a little white ball in the Crawford Boxes for a walk-off grand slam to end the game, 8-5, in the 11th inning. The Astros got all three men on base and scored the grand slam with two outs. You couldn't have scripted the end of this night better. Screams, yells, chants of "Biggio." A historic evening at the ballpark. Amazing night. He's a great baseball player and citizen of Houston, and we were blessed to have him on the Astros all these years. I go through seasons spiritually when God seems to speak to me often through dreams. I might be in one of those seasons. Let me preface what I'm about to say by stating that I don't believe every dream is a message from the Lord. For instance, I had a dream once that was dressed in a gorilla suit riding a bicycle while hitting people in the back with a tennis racket as I sped by them. I've been hard pressed to derive any spiritual meaning from that in an allegorical sense, nor has it come to pass literally, so it was probably bad pizza. On the other hand, I had an interesting dream this past Friday night that left an impression on me, and it wasn't until Sunday morning that I believe God confirmed He is definitely trying to get me to focus on a particular scripture or idea. In the dream, I was invited to be a guest speaker at an event. Although I'm not sure what the event was, it was held in a large arena. The inside of this place looked the like the Astrodome, although I don't think it was. A unknown man approached me and said, "We'll be getting started in about five minutes." I looked at my watch, and the time was around 7:25 p.m. When he walked away from me, I suddenly realized that I had come unprepared. I had no idea what I would speak about. I remember being surprised at myself for coming to this huge meeting with nothing to say. I asked the Lord, "What do what me to speak on tonight?" God's still small voice gave me a scripture: "And I am convinced and sure of this very thing, that He Who began a good work in you will continue until the day of Jesus Christ, developing and perfecting and bringing it to full completion in you." (Philippians 1:6). That's the last I remember. It's a wonderful promise in the word of God, and the scripture alone is encouragement enough. However, when I showed up at Lakewood Church Sunday morning and Pastor Joel's sermon was about God being a God of completion, and the main scripture reference he used in his sermon was Philipians 1:6, you might say I left the service recharged. (Joel's sermons are on a two or three week delay -- definitely catch this one on the Lakewood Web site or on the TV in a couple weeks if you weren't there. Great stuff). Strangely, in the past couple months or so, I have had roughly three "public speaking" experiences in dreams. Prophetic? Who knows... I think the point is God wants to let me know that though it may seem at times that the plan of God is derailed on on back order, it isn't. He's still working on everything. It's most definitely not happening on my timetable. No surprises. I can't ever remember a time when it did. I think I'm also in a season in which I might blog more often. My first thought was, I've never seen this many born again folks skipping Wednesday night church together. I've been in Nashville for a couple days, and I'm kicking back in my hotel room now. The three-hour extravaganza known as the 38th annual Gospel Music Association's Dove Awards was held at the Grand Ole Opry House last night. Another big night for Chris Tomlin. Aaron Shust stepped up to the platform several times to receive awards as well. A full list of winners is here. Highlights: Prior to this event, I'd never seen MercyMe live except at an "unplugged" KSBJ Brown Bag show. They we're good there, but they sounded incredible last night. You can't go wrong with TobyMac and Kirk Franklin performing together. Stellar Kart, Aaron Shust. And Chris Tomlin and Christy Nockels leading worship together? Awesome. A couple of the bands that I would have really liked to see live, Leeland and Family Force Five, were shown on screens via video hookup from another Nashville live music venue. At first I couldn't tell if we were actually watching live footage or if it was taped, but it was a nice touch. Natalie Grant, Brian Littrell and Donnie McClurkin were great as hosts. The presenters were excellent, too. The unfortunate thing is that the televised version isn't going to be quite as entertaining as the live version, because some of the absolute funniest parts of the show turned out to be mistakes and behind-the-scenes stuff. Donnie McClurkin stumbled through part of an introduction, and there was a portion with Dino and two other presenters that was hysterical. I guess the message there is you need to see the show live. I wasn't sure how rare it was for someone to come in from out of state for the Doves. This was my second year to do so. After chatting with some people seated near me, I discovered they had come in from Pennsylvania -- and this was their eighth year to visit Nashville for the event. Larry the cucumber and his tomato friend were something else. I'm afraid I need to come clean about some thoughts I had last night. Do you remember when the video was playing and Bob and Larry were being led out by flashlight across the dark stage? Stagehands were working so hard to keep that cucumber standing upright, and to get him up on the platform. I kept thinking how funny it would be if the cucumber fell over. I know it's just wrong to want the cucumber to fall down, but that thing would have required four people to pick it up. I'm sorry, Lord, but you know that would have been entertaining, too. And I realize she was hosting, but Natalie Grant should have sang. Great show!! I got out of the Grand Ole Opry House, came back to my hotel and found a total blackout. I heard conflicting reports as to what had happened (it had been raining), but my hotel and several square miles around it was completely in the dark. The lights didn't come back on until after midnight. So, it's not quite time to leave Nashville yet. I've got to figure out what to do this evening. I imagine it would only be proper for me to find a place to watch the Rockets playoff game. There must be a place in this big bad city that is airing the game. I got a real treat the other night when I had some "authentic" Tennessee Mexican food. I'm serious. A guy at the gas station suggested I check out this Mexican food place. At first I was apprehensive because I eat more than enough Mexican food in Texas, but when I drove by the restaurant and read the sign that said "authentic," well, I just had to check this out. I have to be honest and say it wasn't too bad. The guy at the counter even called me "amigo." I walked out thinking, "Man, I'm an amigo of God." I went downtown the other evening. Nashville has a beautiful skyline at night. You can drive just 15 or 20 minutes from downtown and find yourself practically in the country. Big hills and lots and lots of trees. It's very pretty here. I'll be back in Houston tomorrow in time for the Astros game at Minute Maid Park. Why don't you blog more often, John? Thankful to have the tedious Q&A session behind me, I want to talk a bit about advertising. I saw an ad that has me scratching my head. Do we have any high-powered, high-paid advertising executives out there? Anyone reading this stuff who feels they have a grasp on what motivates the masses to need or desire certain products or services? If so, let me give you a scenario and tell me how you would handle it. Let's say I work for you, and you have called an important meeting for our client, a fast-food, fried chicken company. This is a brainstorming session, and we need to discuss how to best move some fried chicken. Here's my idea: How about a guy is in a prison cell, and some guards walk in with a bucket of our client's fried chicken. They toss the bucket down in front of the inmate, who picks up a chicken leg and smells it. He then falls to the ground screaming and yelling, practically convulsing in displeasure. You'd do the right thing. You'd throw me out of the meeting for wasting your time. Well, get a load of this video. Someone fell for it. How's that for selling the sizzle and not the steak, so to speak? Obviously I'm missing something in the translation. Or, this agency is hoping some people are willing to pay nearly $200 for what appears to be very bad fried chicken. I remember a great ad that a guy brought into my college newspaper office. He had a display ad he wanted to run with a big headline: "How to get 1,000,000 people to send you $1." The only other text in the ad was the words, "For more information, send $1 to (his name and address)." After careful consideration, the advisor and the editorial team came to the tough decision not to run the ad, although we commended the guy on his clever writing skills. I hope he graduated and found a job in advertising. Maybe he's got the fried chicken account. Let's spend a few minutes in God's Word, shall we? Jesus has just performed his first miracle by turning more than 120 gallons of water into wine at a wedding. If he thought the Pharisees were bad, imagine him pulling that stunt today in America, if he were on planet Earth now. He'd never be able to walk into an evangelical church in the U.S. again. They'd have no part in that nonsense. Seriously, think about it. Jesus said that we would do greater things than even he did (John 14:12). If you're looking for something great to do for God in the miracles department, I suggest pulling someone out of a wheelchair or raising the dead. Turning water into numerous gallons of wine in public sounds like a good way to find yourself church shopping. It was an interesting choice for Jesus' first miracle, wasn't it? He is God. He could have done anything amazing that he wanted, but He chose to turn water into wine. It reminds me of a story I heard once. A parishioner asked his pastor if it was OK for Christians to drink alcohol. 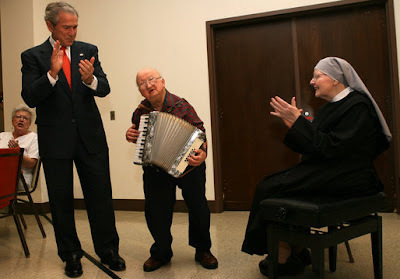 "But I thought Jesus turned water into wine," the parishioner replied. "He did," said the pastor. "So pour yourself a glass of water, and when Jesus turns it to wine, please feel free to drink it." Isn't that just like our God? Saving the best for last? That's kinda the way I like to look at my life during this season. Sometimes it feels like I've run out of wine at this little party, so to speak. What's God saying here to me and you? "The best is yet to come." I know I haven't typed in a while...I've been quiet and trusting. How many birthplaces could Texas possibly have? At the intersection of Highway 225 and Center Street in Deer Park, Texas, is a sign that reads, "Welcome to Deer Park, The Birthplace of Texas." I get a chuckle now each time I drive past it. A few weeks ago I took a roadtrip up to Austin and San Antonio for a few days, enjoying the beauty of the Texas hill country and frankly, two cool cities. On the way up, I passed a sign somewhere on 290 that reads, "Welcome to Washington County, The Birthplace of Texas." I figured someone at the Alamo could tell me which is actually the birthplace, so while I was in S.A. I stopped by. A man very well-versed in Texas history gave an excellent presentation on the battle of the Alamo. I pulled him aside after his talk and asked him the question. According to him, the Alamo is the birthplace of Texas. Could someone please email me and let me know where this state was born? Shouldn't folks come to a consensus on something as important as the birthplace of Texas before printing it on multiple signs and posting it on several different Web sites? I was born only at Memorial Hermann in the medical center. That will never change. I can't say I was born in two or three different places. Although I experienced the "second birth" (John 3: 3-7) in Deer Park -- one of the many birthplaces of Texas. I started thinking about this because I caught a portion of Jay Leno last night and he was talking about roadtrips with a guest. I love roadtrips. I enjoy them so much I video them. I was so excited about taking a week of leave from the Marines to visit Houston in 1993, I decided to video the drive from Barstow for some reason. Long streches of I-10, a $5-a-night room at Ft. Bliss in El Paso, and strange roadside structures made by UFOs all comprise this nine-minute yawning festival. I warned you. Why did I hang on to this videotape for so long? Why would I shoot such a video? Maybe, subconsciously, I wanted to hang on to a piece of nostalgia that could always remind me that no matter where this life leads, I can always find a road to Houston. Maybe it's not quite so deep. Maybe I just wanted to videotape a long drive. I arrived back in Houston yesterday. To sum it up: California was excellent! I decided that I would spend a day in San Diego during my trip to California this week. I headed down the 405 from L.A., which is a nice drive (when the traffic is light). If you're not from California or haven't visited you wouldn't believe how beautiful even the freeways are there. Imagine green rolling hills with big houses lodged in them on one side of the road, and the blue Pacific ocean on the other side of the road. Houstonians, think West U on the beach. On the road, I spent my time enjoying God's presence, the scenery and the music on the radio. There are lots of songs in heavy rotation on radio on the West Coast that I haven't even heard in Texas. Specifically, there's a song called "Someday" by a group named LaRue that's getting played a lot out there. I heard it numerous times in Los Angeles and again in San Diego. I like it a lot. It's a "Princess thoughts" type of song. The Mat Kearney song "Nothing Left to Lose" is awesome (I did hear this one on KSBJ in Houston yesterday). My San Diego visit was actually a trip down memory lane for me in a sense, because I lived there for two or three years in the mid-1990s. The 405 takes you through Camp Pendelton as well. I got a little emotional as I approached my old apartment and as I visited some of the old stomping grounds. It never fails that when I visit an old residence I experience a flood of emotions. This was the case in San Diego. I really enjoyed living there, and it was a pivotal season in my life. Lots of good memories. That's where I was for the second Rockets championship in 1995. We like to talk about how we Texans are friendly and hospitable (and we are), but one memory that will always stick with me was my whole office of Californians taking me out the evening of game four against Orlando. They watched that entire game and celebrated with me -- just because they knew how important that championship was to me and my city and how excited I was about it. Good people. I didn't have a lot of time this trip to S.D., so I went down to Mission Beach and grabbed chow in Old Town, some sightseeing and then north on the 405 back to Los Angeles. Well, no question, L.A. is a wonderful place, and I enjoyed hanging out there. I eagerly look forward to my next trip west. Well hello! Another nice day in L.A.
Tonight I headed over to Sunset and Hollywood Boulevards to see what was going on. The area in front of the Kodak Theater on Hollywood is closed to vehicle traffic in preparation for the Oscars Sunday evening. There is a huge tent that has been raised across Hollywood Blvd., but you are still able to walk into the mall there. It's a three-level shopping center where I grabbed something to eat and a coffee at the Starbucks. I wanted to go handle the Oscar LucyinLA talked about on YouTube but that little section of the mall closed at 8 p.m. I took a stroll down Hollywood Boulevard. It's an an interesting walk. I also was down in Burbank for a while earlier today and then later drove to the beach in Santa Monica. Pretty water. This area is gorgeous. I drove all the way down Sunset from the the Sunset Strip area until it dead-ends into the beach, then on the Pacific Coast Highway for a bit. This place is beautiful. I landed this morning and got checked into my hotel. Then, I spent at least a hour driving around looking for an In and Out Burger. I've been craving those things! I finally found one back over near LAX. Didn't do much today other than drive around a little bit looking at the town. Again, this is an attractive city. The weather was a bit grey and rainy when I landed around 8 or 9 a.m., but by early afternoon it was blue skies and cool temperatures. Perfect. By the way, great Christian radio in this city. I've been listening to this station while driving around. I just got back from a late dinner and I'm kicking back in my room now watching the local news...worn out. It's just about lights out here. Was Joseph a bad or ineffective believer? Did he miss it greatly? More than a decade is a long time to live in the midst of pain and craziness if you're life is pleasing to God. Is it possible for a Christian to have a daily prayer life and quiet time in the Word, be obedient to get the sin out of their lives, have a true heart toward the Lord and the things of God, and still go through a prolonged period where nothing makes sense? Sometimes I wonder if Joseph was alive today, and we looked at him critically during the eighth or ninth year of his ordeal, what our assessment would be of his spiritual life. Certainly, he couldn't be walking by faith with an obedient heart. Faith moves the hands of God, so He wouldn't be in that situation -- for that long -- if he truly believed. I got it! Maybe he's not paying his tithes. Or, it's probably a sin problem. There must be a hidden sin he hasn't addressed or repented from and left in the past. (This one is actually the most silly, because every one of us has sin problem...it's called the sin nature -- reread the second half of Romans 7. Thank God for the sin solution: Jesus). I'm not minimizing the role of disobedience or bad decision in the trials of life. That's definitely part of the equation. There's not one of us who hasn't "reaped what we've sown," so to speak, while working out our salvation. That includes me and you. But the Bible doesn't mention anything specific of that nature in Joseph's case. We have to assume he was fallible and made mistakes like the rest of us, but for the most part was doing the right things, and all hell broke loose in his life. Can you imagine how we would dissect, make assumptions, and judge that guy if we didn't have the luxury of knowing the end of his story and what God was doing during the process? I don't know if Pat will receive or answer my question, but you can view The 700 Club online each day at http://www.cbn.com. Quite possibly the most entertaining TV commercial I've ever seen. I got a call today from my sister, who reported that her and her husband accepted an offer from his employer to transfer to the Denver-area. They've been considering this option and praying for many weeks, and now believe this is the right choice for them. They begin the process of selling their home in Houston. She seemed excited about the prospect of living in a new town, although she is understandably not so happy about moving away from her family, leaving her church, the city of Houston, etc. I told her that's what airplanes are for. 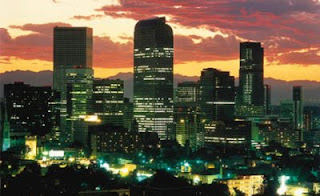 The only time I've lived away from her was when I was in the Marines, so it will be inconvenient not having her in the same city, but the offer was attractive and after much research Denver looks like a great town for them and my niece. I will miss them, but I'm happy for them and look forward to seeing Colorado. I love visiting new places. I'll definitely have to get some Rockies tickets. I had an interesting, fun evening. I went to dinner and then bowling with some friends. I'm not the world's best bowler, but I enjoy throwing the colorful ball toward those pins. I like the shoes, too. The evening started, however, at a Christian bookstore. I arrived at the predetermined meeting place about 45 minutes early. The bookstore happened to be in the same strip mall I was to meet my friends at, so I went inside to burn some time. I recently had a dream that I felt was from the Lord, and I wanted to see if I could find a book on dream interpretation. I've actually had a couple dreams in the past few weeks in which I've seen rainbows. These dreams prompted me to look up references to rainbows in the Word. The most obvious example is the one God put in the sky after flooding the Earth in Noah's day. There is another verse that states, "Look upon the rainbow, and praise Him that made it" (Ecclesiastes 43:2). Anyway, I was looking over a book I located in the store on dream interpretation. 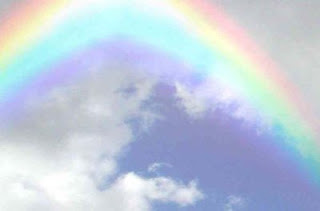 I found an entry for "rainbow" in the book and it stated that within a dream this represents a sign of God's covenant, protection, or a promise from Him. I took some encouragement in knowing that He was trying to get a very important point through to me. We serve a convenant-keeping God. I realize that, and know it to be the truth, but I think sometimes God just wants to emphasize a point when we just ain't getting it. I put the book back on the shelf and started looking elsewhere. Several minutes later a young woman from behind the register in the front of the store came back to my area and asked if I was finding "everything I needed." Generally, I don't like it when I'm in a store and someone asks if I need help. I always feel like if I needed help finding something, I'd be smart enough to ask for it. But it turns out I did need some help. "Anything catching your attention," she asked, smiling. "Well, no, not really, I'm just looking..."
She reached over to the rack of books I'd previously been standing in front of. She then picked up the very dream interpretation book I had been reading out of...from hundreds of other books shelved there. "How about this one?" she said, handing the book back to me. Several rows of books stood between us while I looked over that book to begin with. How in the world did she know I had been reading that book? "Well, actually, this is the very book I was looking at," I said, a bit confused. "What are you dreaming about?" I hope I'm doing this situation justice in my description, because it was weird (in a good way). It felt to me like one of those "God moments." She preceded to pull several other books off the shelf that were similar in nature, and handed them to me. I had three or four books in my hand at one point. After explaining to her what the book had described about rainbows, she stated that dreams could be a way God steers you and "lets you know that you're right where you need to be." By this time, I don't know what to think anymore. I'm really enjoying her insight on my book shopping, however. She quoted from the book of Joel's second chapter that states that visions and dreams are part of the outpouring of God's spirit on the Earth in the last days. Then, to make things even more interesting, she said she had to run out to her car. "What," I said, "what is in your car?" "A book that we don't have on the shelf today, but I want you to see it." She came back in with a book entitled, "The Prophets Dictionary," including a huge section on dream interpretation. She just happened to have it in her car, mind you. We looked up "rainbows" together. Unusual Coincidences. I have paid little attention to these for most of my life. It's only been in the last couple of years that His language has become more obvious to me in this way. While it would be wrong to say every coincidence has the voice of God in it, God is speaking through them more often than you might think..."
With that, I obviously decided I couldn't leave the store without the book. I'll start reading it tomorrow. P.S. If you are the nice young woman at the bookstore and you happen to read this, thank you! Be blessed!